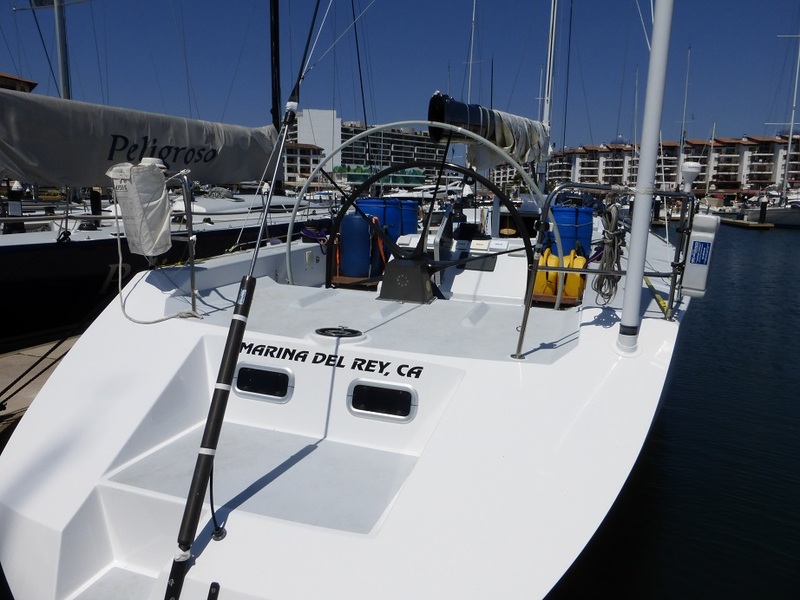 Nancy got a text today from Jeff, the Regatta Manager for the San Diego Yacht Club. 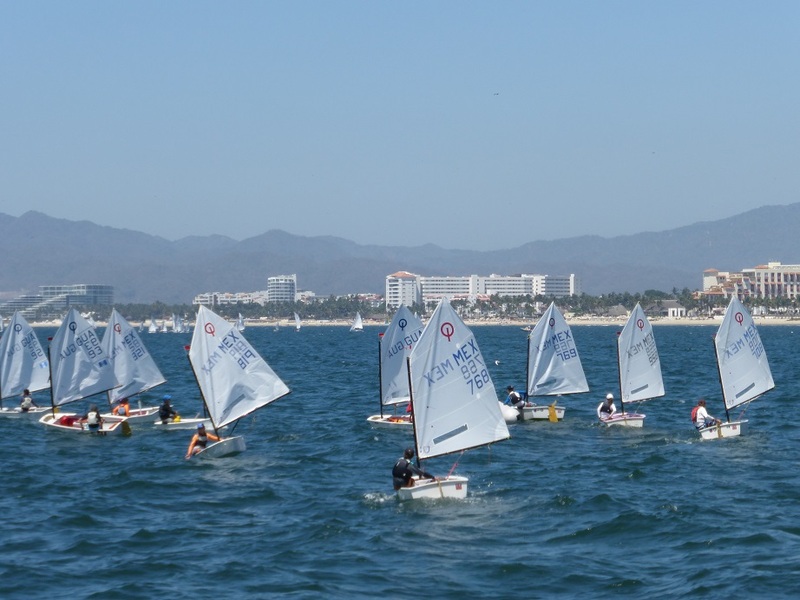 The bi-annual race from San Diego to Puerto Vallarta is underway. And we won’t be there for the finish. 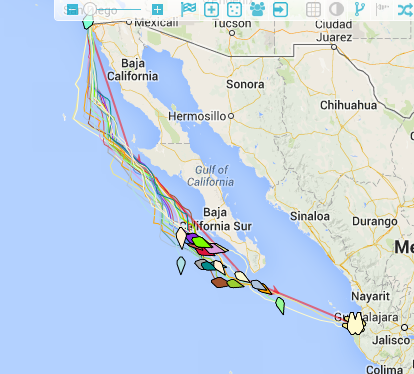 while the smaller/slower group that left a day earlier is already just off Cedros Island doing 13.8 kts. It’s going to be a fast year. If anybody from Grand Illusion sees this, Nancy still wants a T-Shirt. Insult to injury? Sure. A race sponsor this year is El Jimador, the official tequila of Bright Water. And here we sit. I hope the boats get their SWAG without my help, but I hope they miss us, just a little. 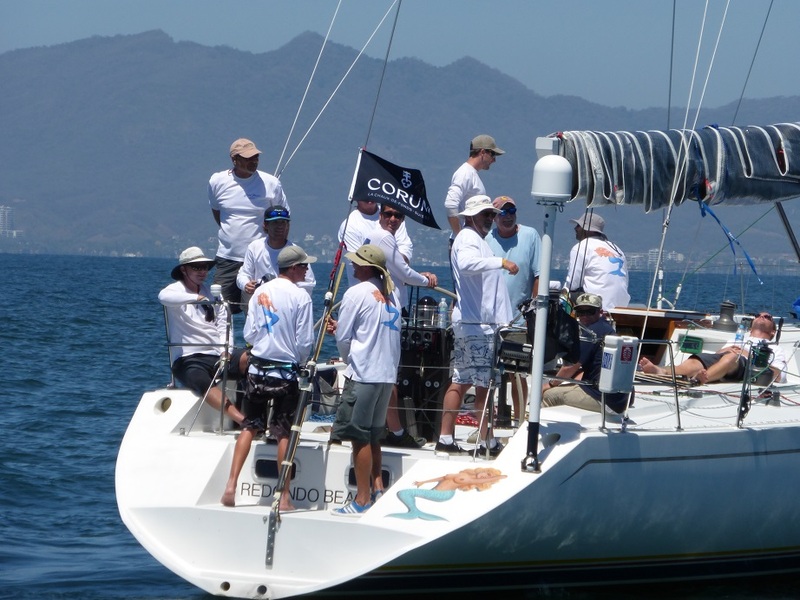 We spent another day on the Committee Boat for today’s start for MexORC. We had no duties, we were just there as spectators. Grand Illusion showed up, flying their battle flag. Nancy still wants one of their crew shirts. See if you can figure out where the sail engineers think the loads are. Each black line is a carbon fiber, captured between two polyester (Mylar) sheets. 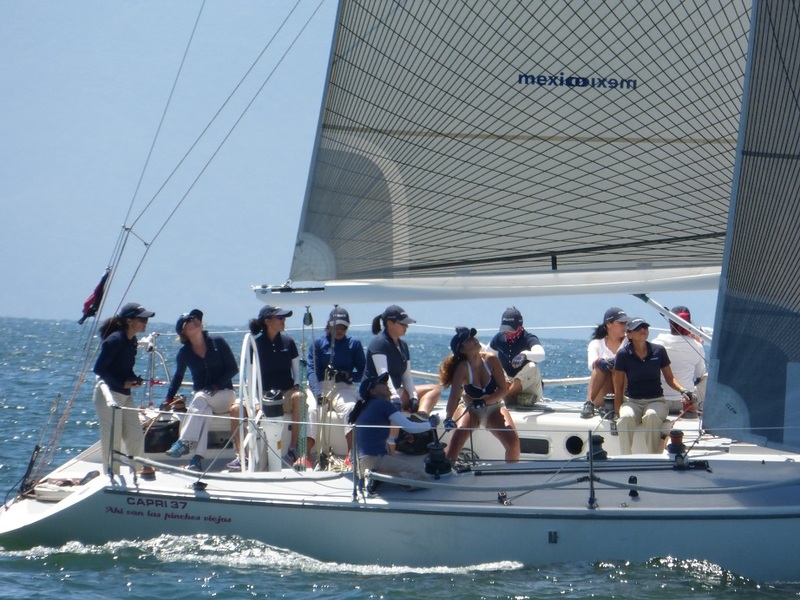 Las Chicas de el Velero. Fancy sails, yarn tell-tails. Just like us. Photographed though polaroid lenses, you can see the strain in the mylar panels. I’m not sure if the strain was created during sailing or manufacture. Besides being a pretty boat and a pretty picture, this shows how much surface area is raised from the water when the boat heels. It doesn’t show, but you can sort of tell, how much the waterline also increases when the boat heels. Longer=faster. The start today was staggered. 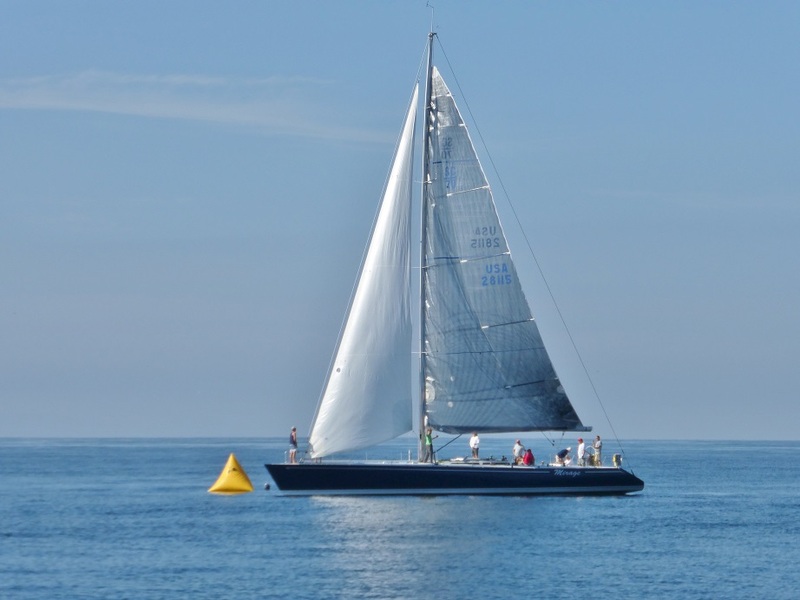 Slower boats started earlier, timed against their rating and the race characteristics. If they did it correctly, everyone finished together. 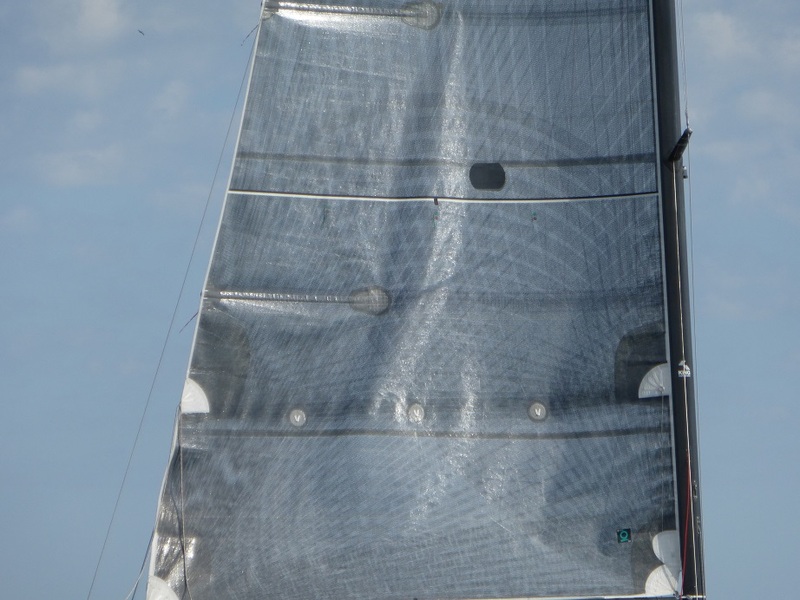 After all the monohulls started and left, a huge Optomist dingy fleet showed up and surrounded the start boat. It was wild, but crazy unsafe. I finally hailed #768 (a twelve-year-old boy) and yelled “Senor, Mas Peligro!” and pointed. He took one look and herded everyone away from the start line. And Orion showed up. It started an hour or more after everyone else. It didn’t even untie from the dock until everyone else had started. Fast is not the right word for this thing. It’s a whole different kind of boat. It sounds like an airplane going by. Lining up for the start. The Laser is the stand-on vessel. Orion gave way. Some interesting stuff about racing boats. 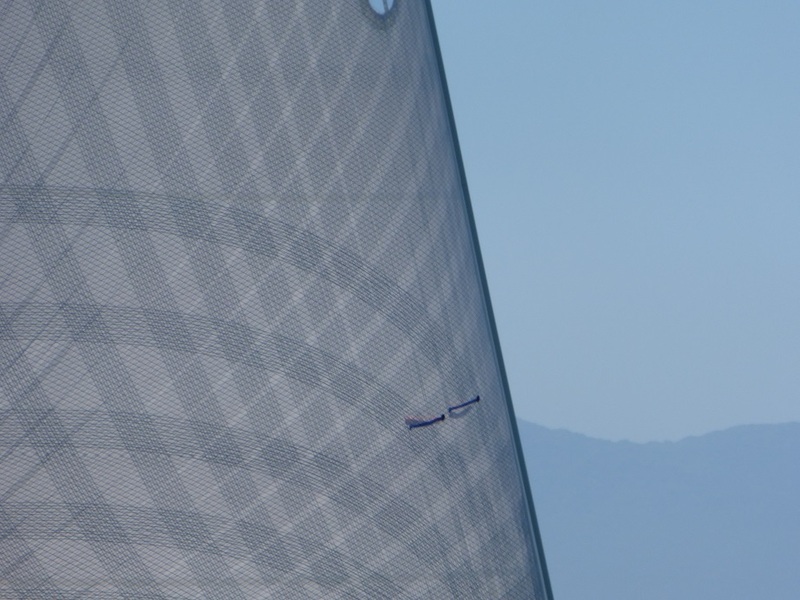 The sails are made on a shaped mold. A mylar panel is laid down, then graphite strands are stuck onto the mylar along the load-paths, then another layer of mylar seals the whole thing together. The graphite strands take the loads in pure tension, allowing the sail to maintain perfect shape. 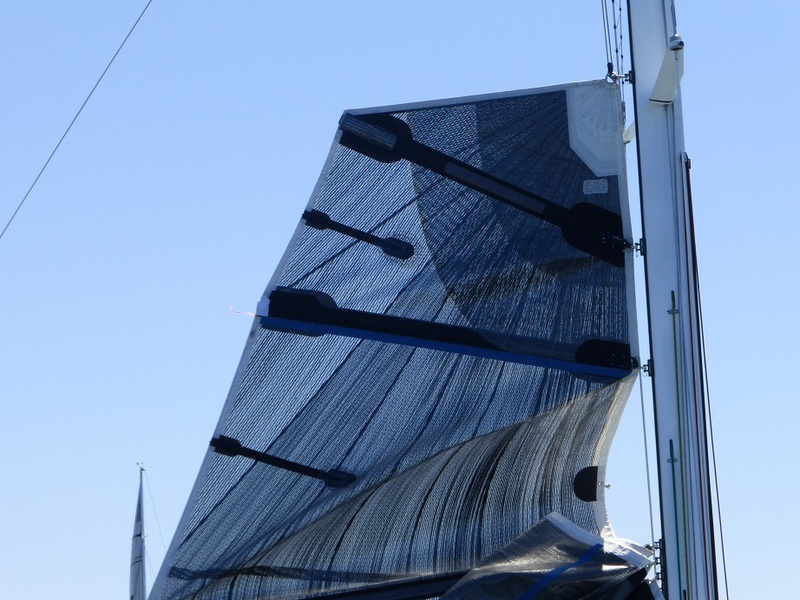 On the downside, the sails are fragile and have a limited life. I think that’s a delamination between the mylar sheets in the middle of this picture (Edit: It’s not. See the comments section for discussion of this entire paragraph which obviously should have been longer and more complete but it’s only yammering on the internets so we’ll just leave it as is). 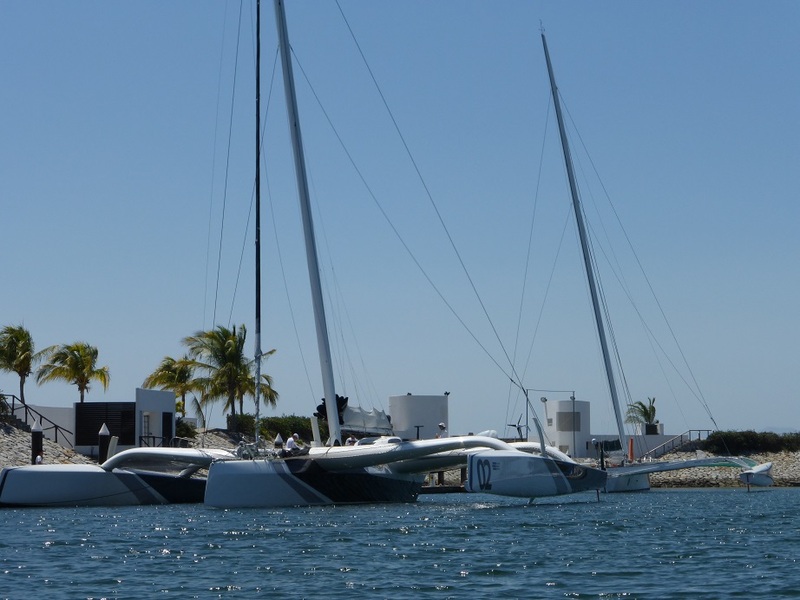 The two trimarans are moored near us in La Cruz. They’re too wide to fit into Marina Vallarta. These things are wild. This is the port ama of Orion. The curved thing running vertically through is the moveable foil. There was some discussion whether it pulls down on the windward hull, or lifts on the leeward hull, or both. I still don’t know. A friend watched the boat motor into the marina. 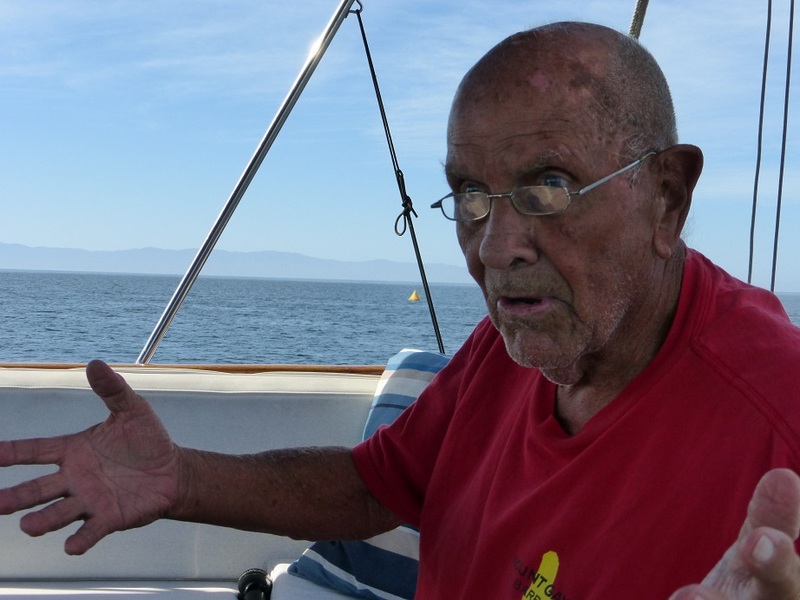 He said it was very apparent that the boat didn’t weigh very much – it bobbed like a cork in the chop. Edit: Went and had a talk with the crew. 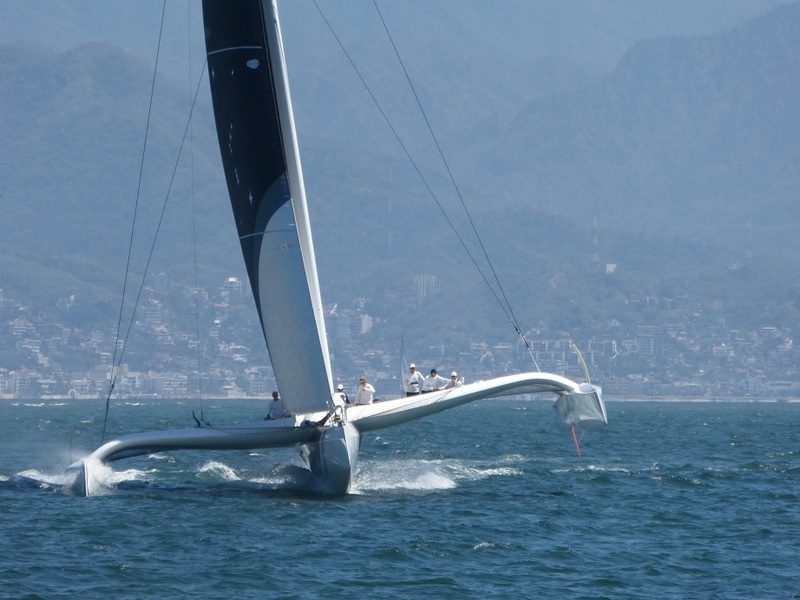 The foils lift up on the leeward hull. The angle of attack can be changed, but not while the foil is loaded. They do not use water ballast to balance the sailing forces, although Mighty Merloe has a water tank in the bow for fore/aft trim. This is the second-place tri, Mighty Merloe. 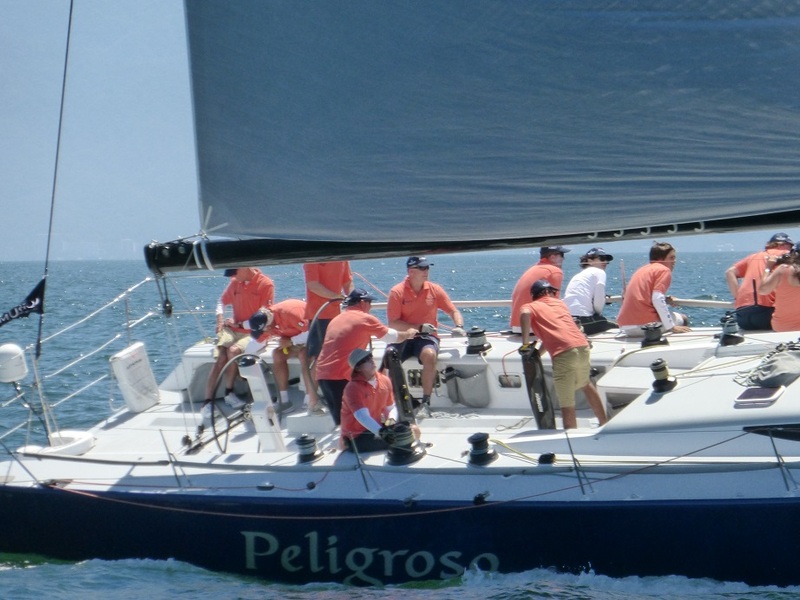 The orange blade sticking out of the center hull is the dagger-board, used to balance the sail loads so the boat doesn’t just drift downwind. 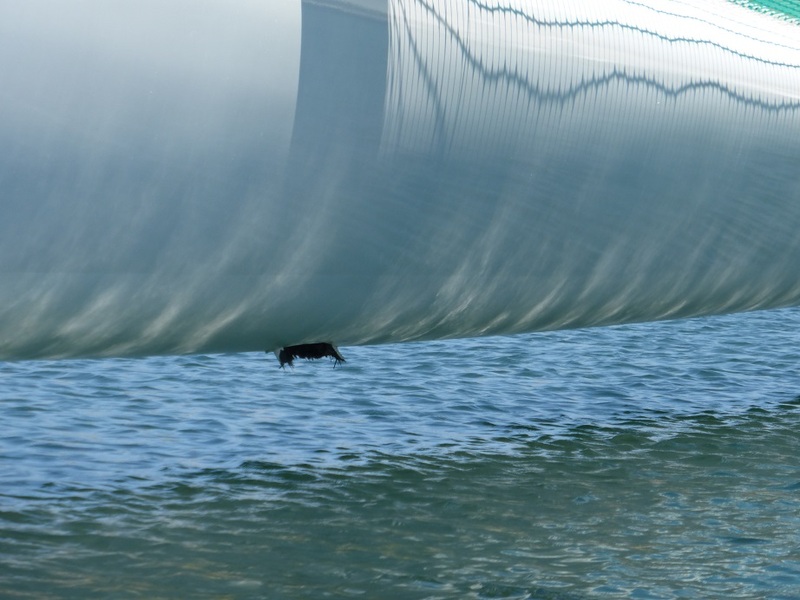 It’s stunning how small the underwater foils and rudders are, but when you average 20 knots, like these boats do, it doesn’t take a lot of underwater surface area to develop incredible forces. 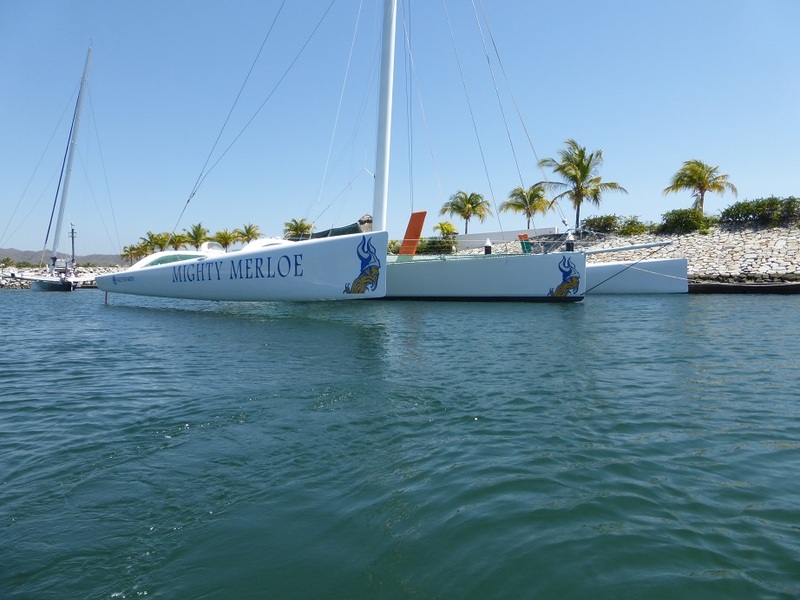 Apparently the two trimarans were racing side-by-side until the starboard foil snapped off Mighty Merloe. The pieces are still there, probably wedged into the hull trunk. They still finished strong even though they were only fast on one tack. 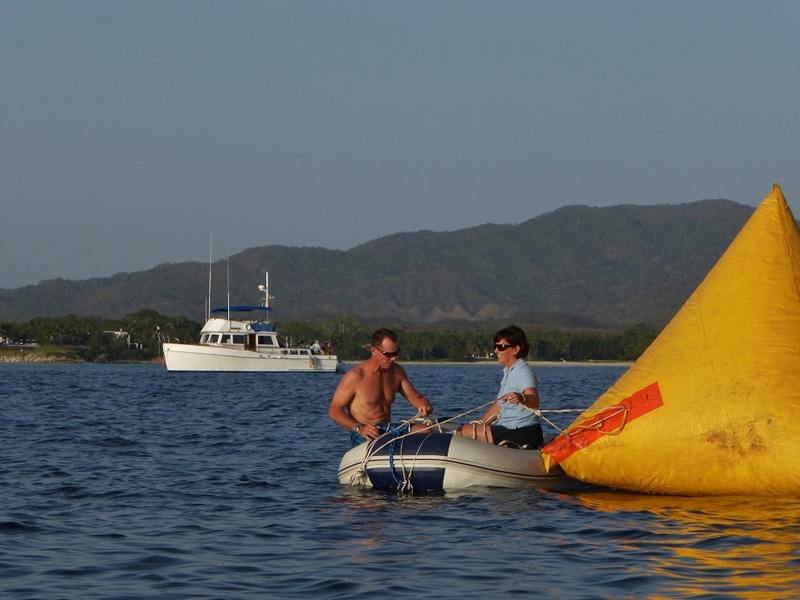 Several of the boats will also race this week in MexORC, a series of big-boat buoy races here in Banderas Bay. 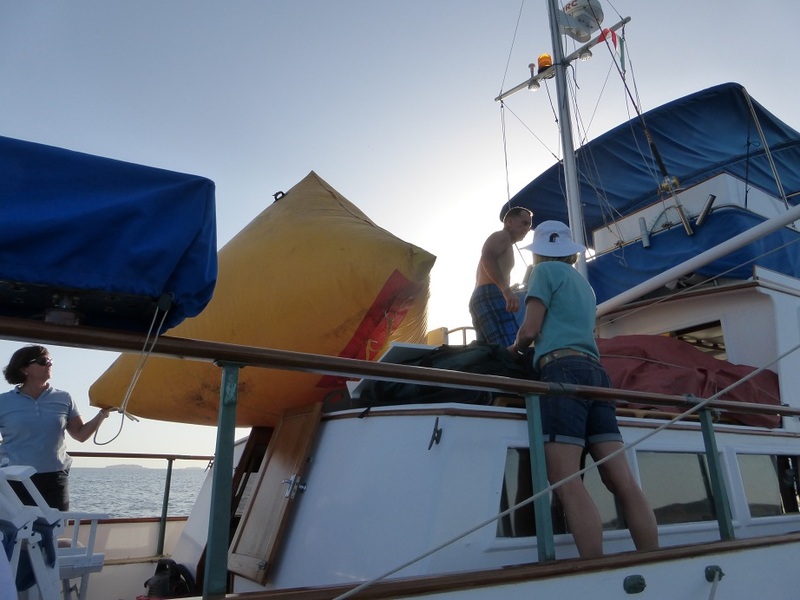 Others spent Saturday stowing the expensive graphite sails, fitting cheaper and more durable Dacron sails, and loading fuel for the trip upwind back to San Diego. Several boats will carry extra fuel in plastic drums lashed on-deck. A good way to get an idea of the tech involved with these things is to look at the graphite/epoxy wheel. Part weight savings, part race-boat bling. 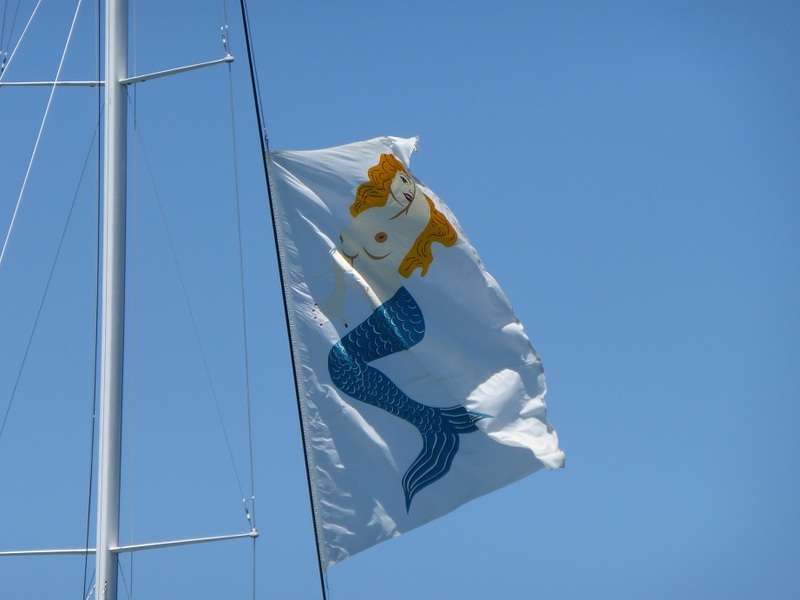 This is the Mermaid on the stern of Grand Illusion. Mermaids are great. We were unable to finagle tee-shirts. 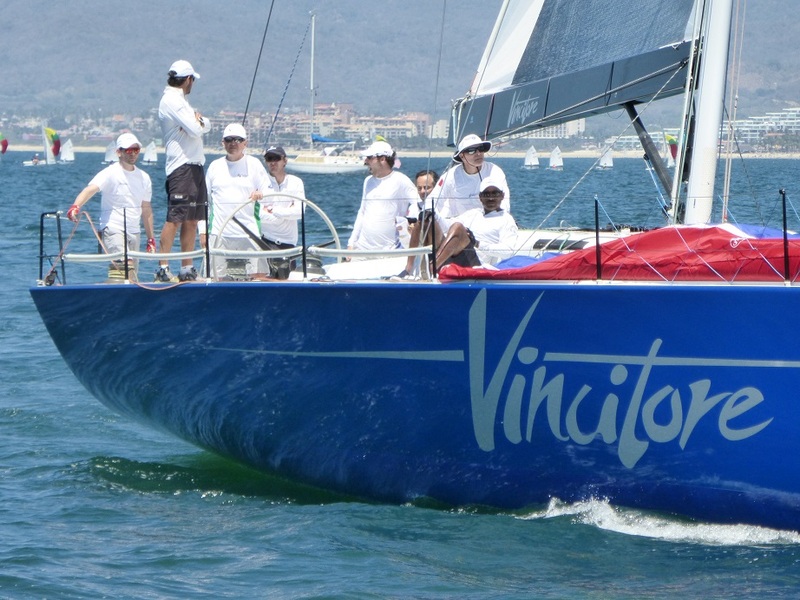 The San Diego to Puerto Vallarta Yacht race continued through the week. As the self-appointed official spectator fleet, we had great seats. then we’d load in the dingy and putt-putt over to Andante to hang out for the rest of the day. 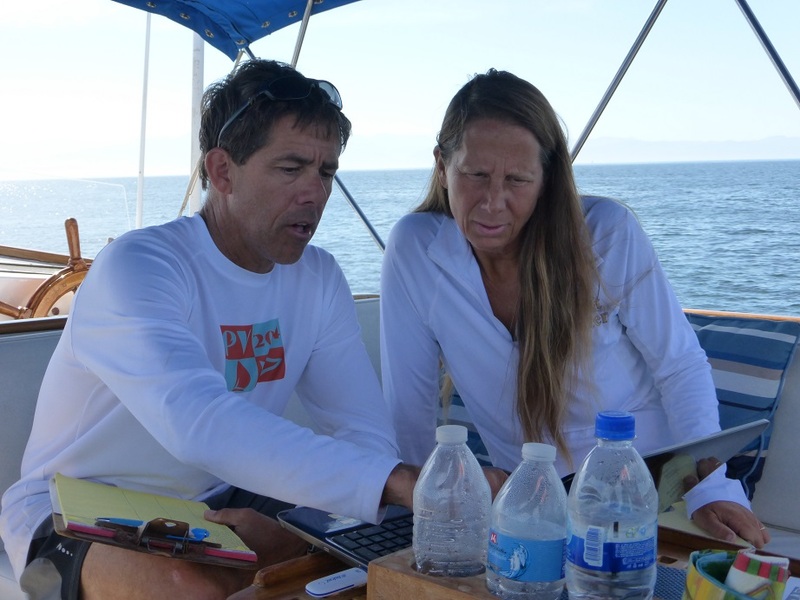 Nancy would spend the day being delightful, pressing the horn to signal a finish, and watching Regatta Manager Jeff enter the numbers and manage the regatta. I would help Mike deliver the beer and SWAG bags to the crews as they finished. Getting back to Andante was sometimes a little more fun than necessary. Mike lives here in PV. 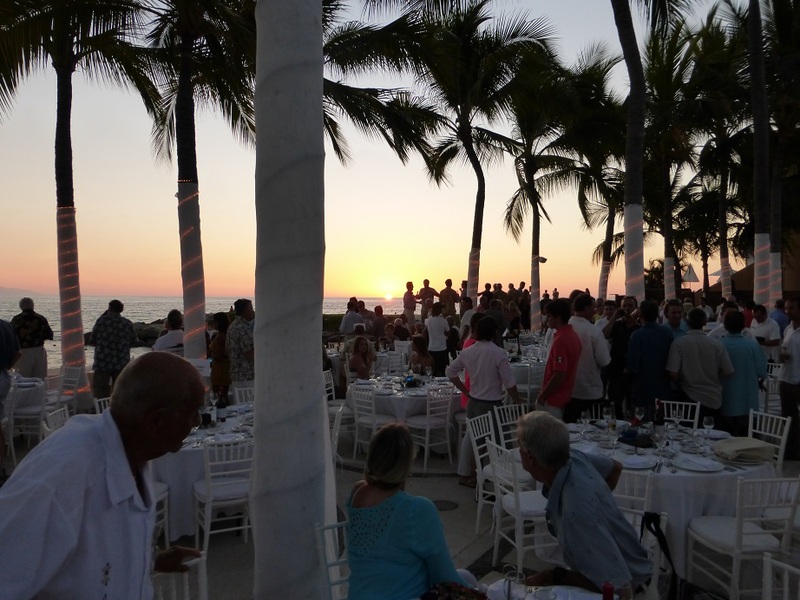 He and his wife Sharon run a stunning retreat Casa Pacifica Sayulita. Please tell him we sent you. 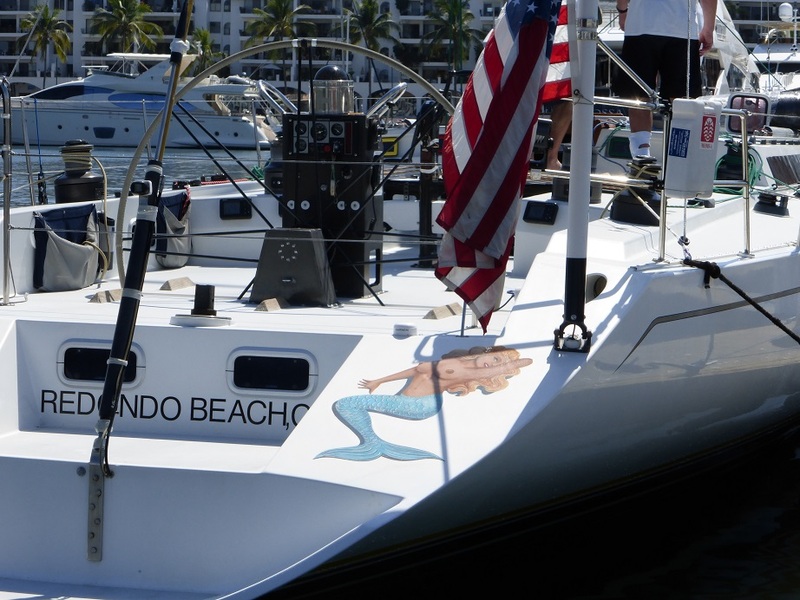 Often there was a good breeze blowing, and the boats were able to finish strong. 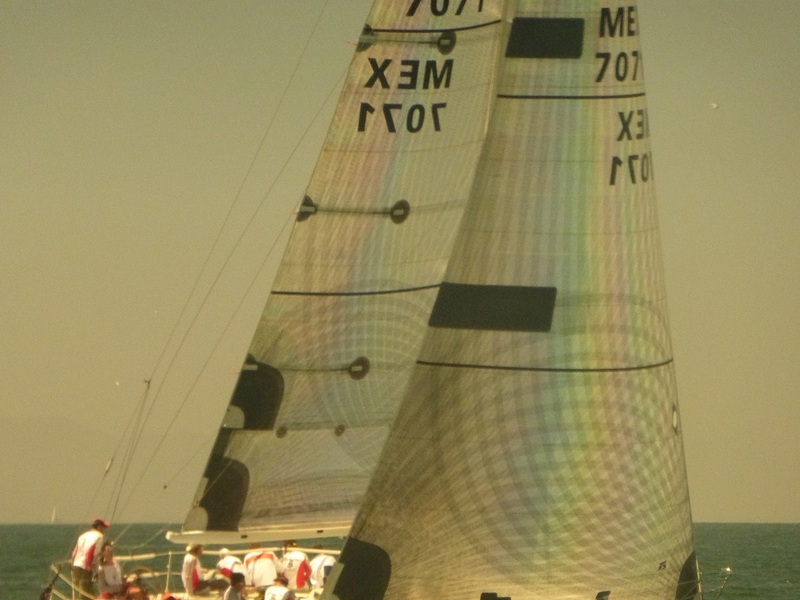 These boats have just sailed 1200 miles, and are drag racing to the line. Fantastic. Other times the winds were frustratingly light. 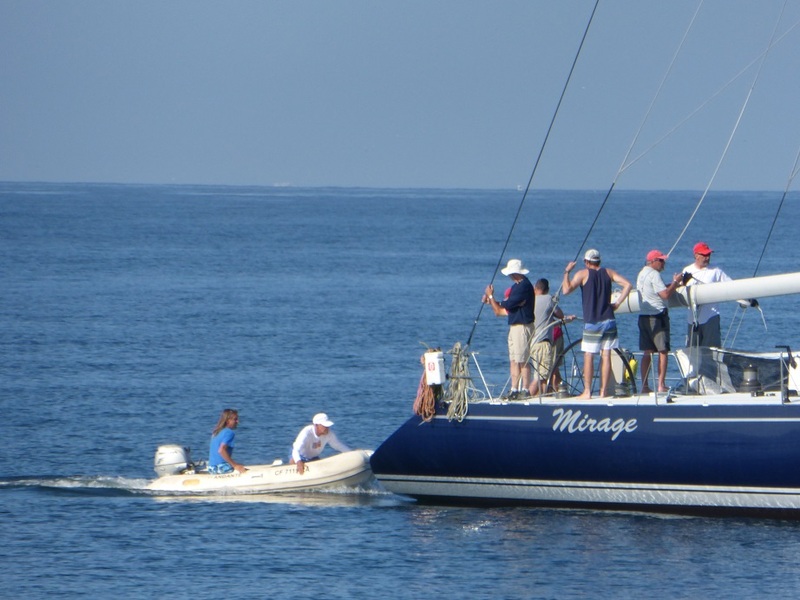 Mirage ghosted in, needing over four hours of meticulous sailing to cover the last five miles and make the line. Brutal. That weird-looking jib is called a wind-seeker. 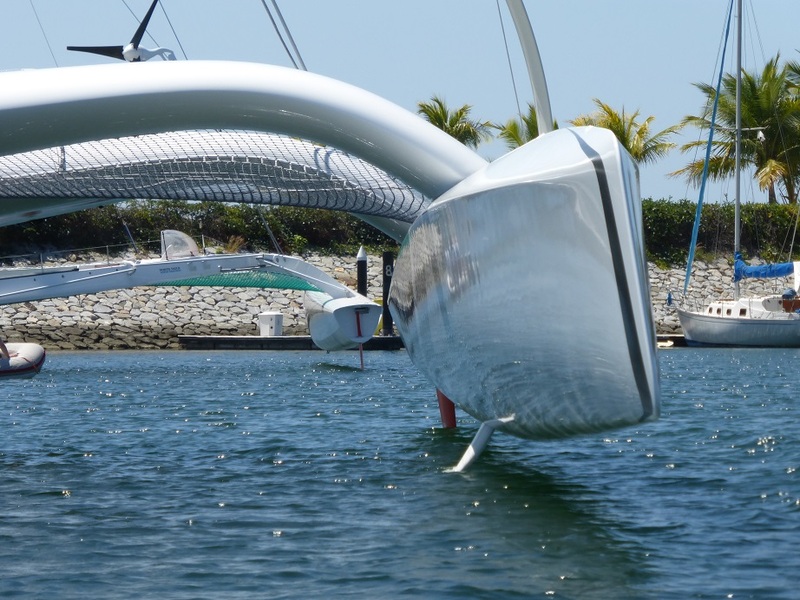 It’s a crazy-light tiny sail that is used to balance the wind loads against the keel lift, allowing the boat to carry the rudder straight(er) and cleaner for less drag. 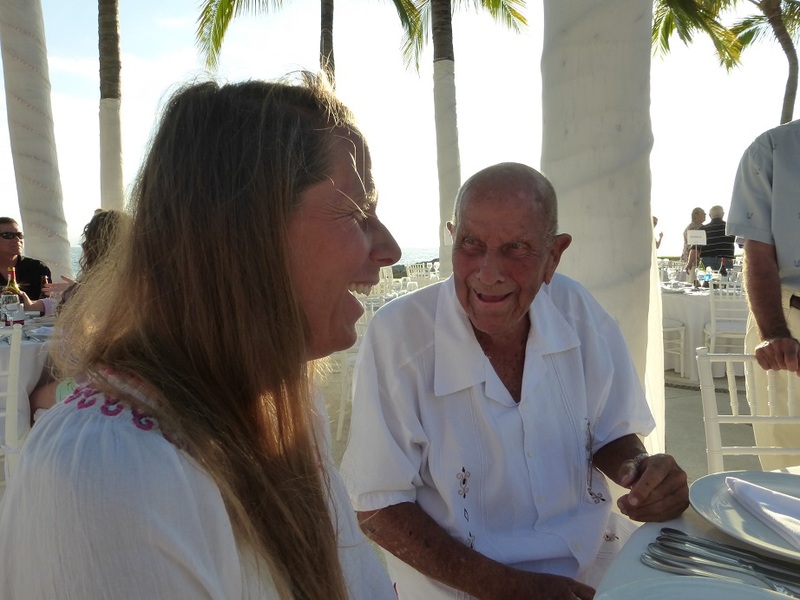 In between boats, Captain Bob and I would trade boating stories and hair-care tips. Since he had been a Vietnam-era Navy Captain and Commodore (with 11 of the 15 available campaign ribbons), and I had hair, it all evened out. 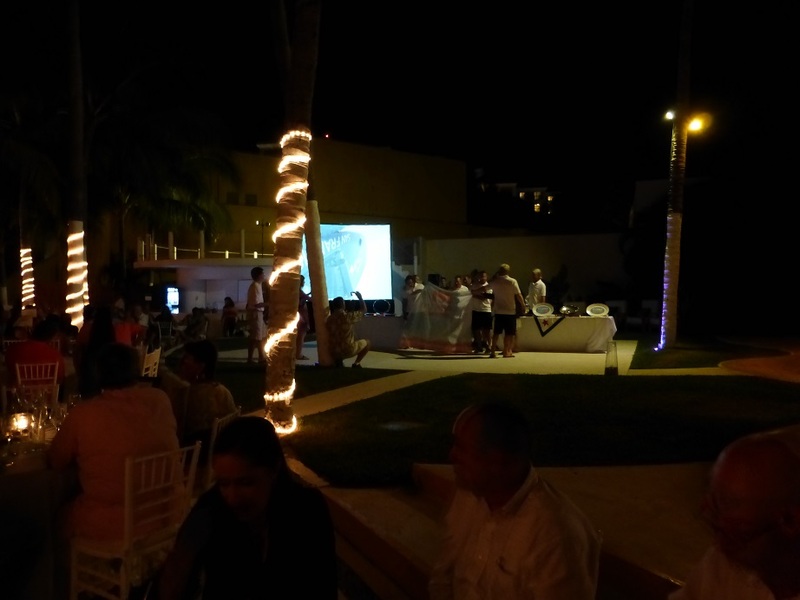 The SDYC invited us to the post-race party at the Puerto Vallarta Westin, an epic hotel on the beach in PV. They found us seats right up front and treated us like royalty. If this was a fairy tale, there would have been a green flash at sunset, but it was real, so the real sunset in this real setting was even better. Awards were handed out, stories were told, and some of our pictures were projected on the back-drop. We had a great steak and lobster meal including a tomato slice and mozzarella appetizer that was perfect. SDYC Commodore Chuck thanked Nancy and me by name from the podium for whatever it was that we did. 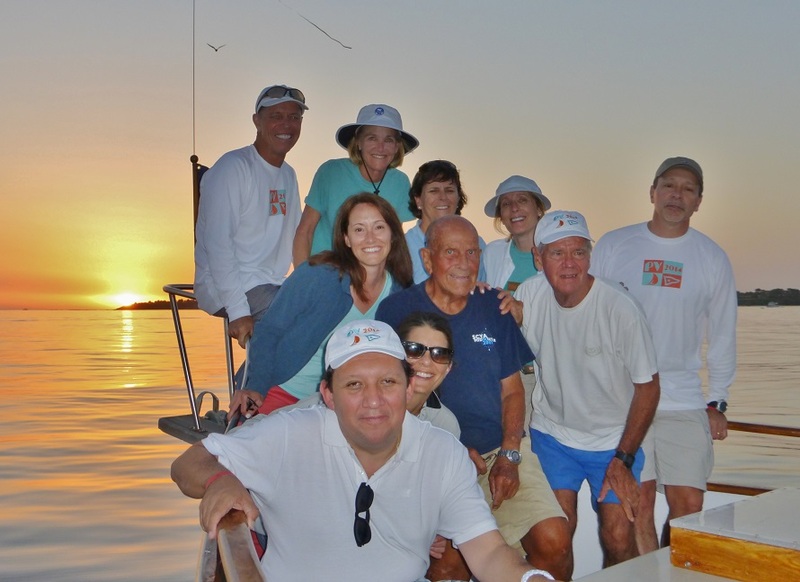 We spent the rest of the evening talking cruising, racing and boating with rock-star racers, wonderful club members, and past, present, and future Commodores from SDYC and the Acapulco Yacht Club. 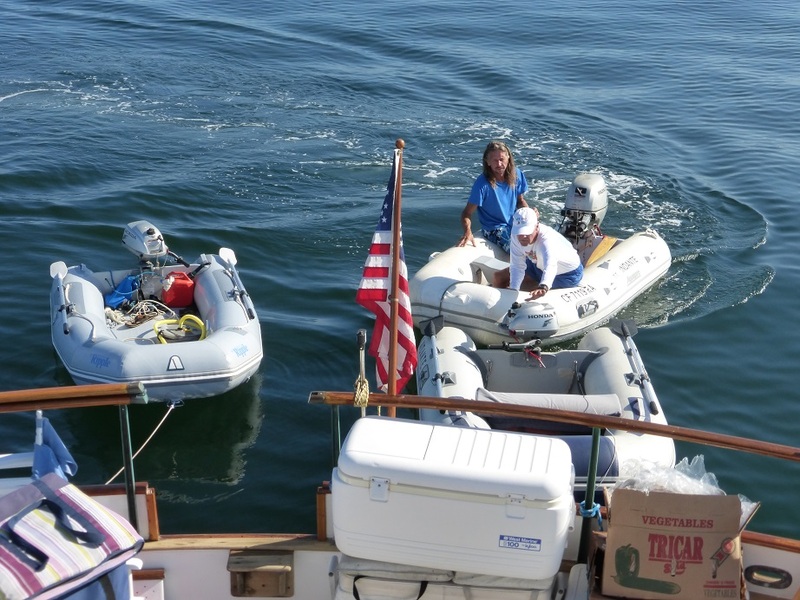 Then the organizers carted us back to Bright Water safe and sound. It is impossible for Nancy and I to adequately express how welcoming and generous the people of the San Diego Yacht Club were to us. What a great week! 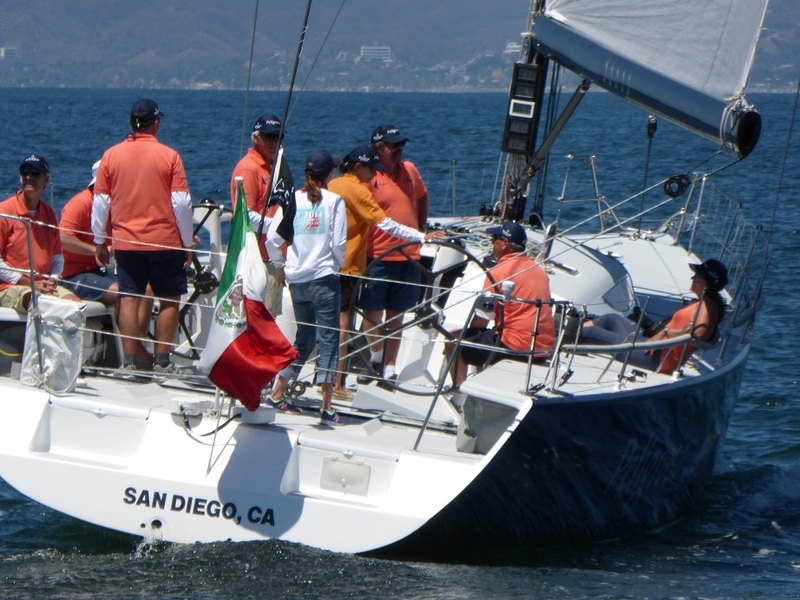 Every two years, the San Diego Yacht Club hosts a yacht race from, well, San Diego to the Mexican mainland. 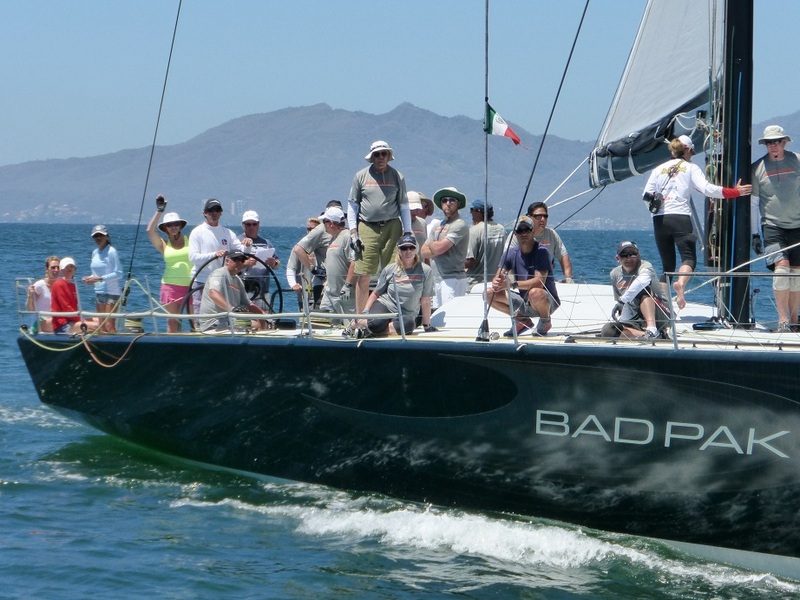 This year the race ends in Banderas Bay. 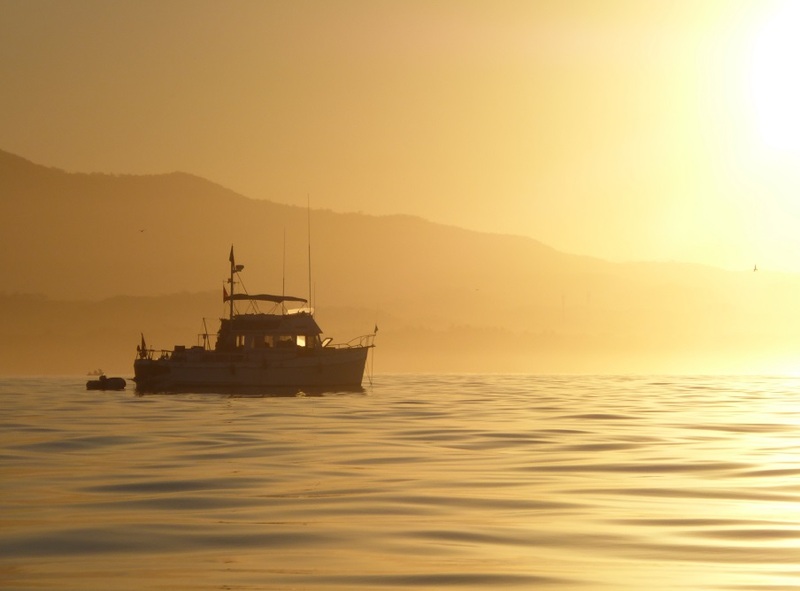 To be more exact, the race ends at a Grand Banks trawler named ANDANTE, anchored half a mile off the stern of Bright Water. We heard about the race yesterday afternoon, did a little web check, and found that the first finisher was expected right at dusk. So we appointed ourselves as the official spectator fleet, loaded into the dingy, and motored on over to ANDANTE. and anchored it to set the official finish line for the race. 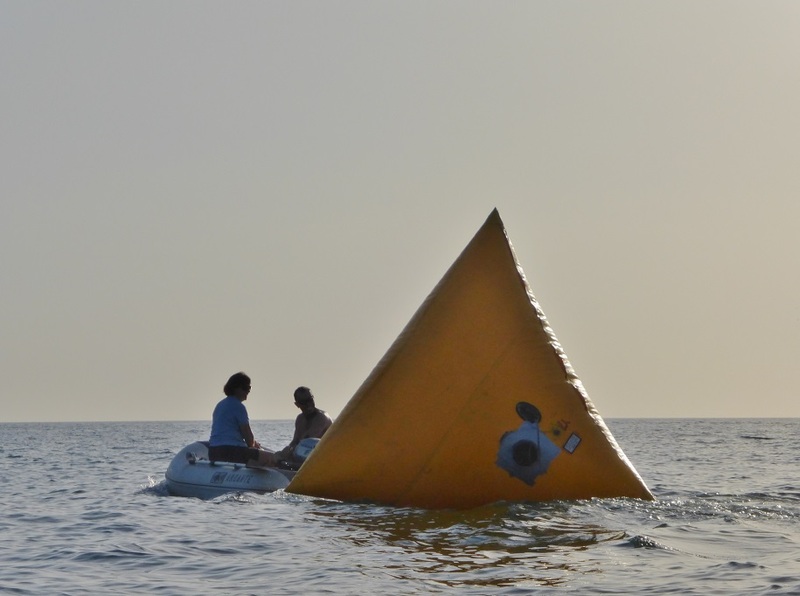 The winning boat was only a few miles out, but failed to make it in before the winds died with the sun. We stayed up and watched ORION finish after 10pm, sailing 1209 miles in 2 days, 8 hours, 33 minutes (56 hours, 33 minutes), setting a new record for the course. The old record was held by Steve Fossett, the balloon guy. 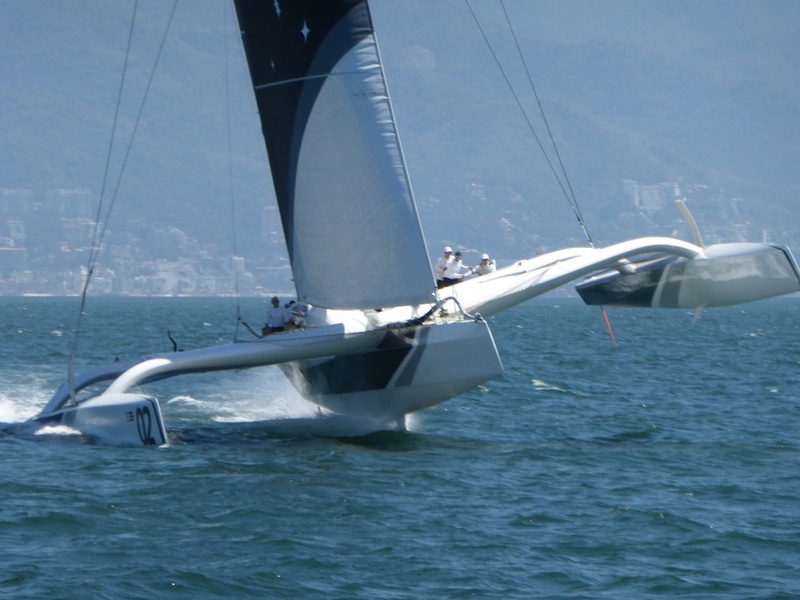 The ORION is a 70′ full-race trimaran. We only saw it by the light of the full moon, but it was awesome. 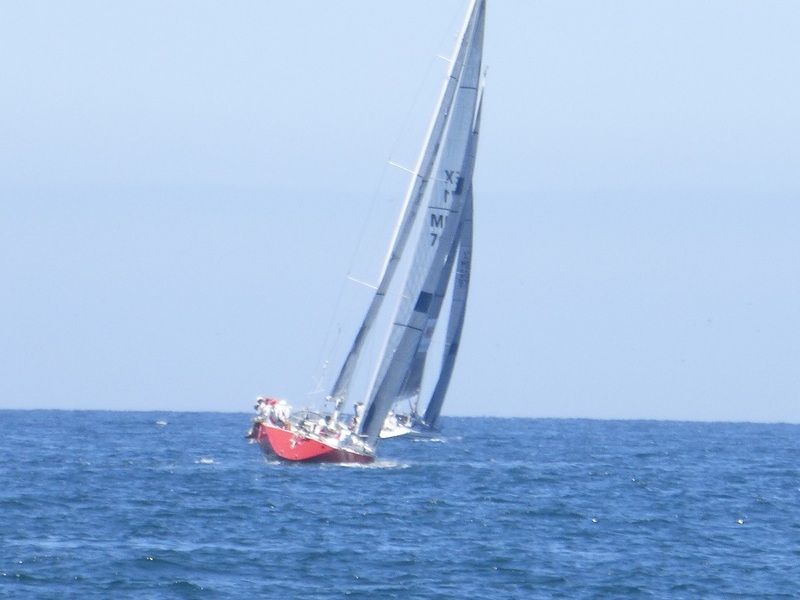 It was making 11 kts in 5 knots of wind. Waterworld stuff. Maybe Wednesday or Thursday we’ll move Bright Water back to La Cruz and get a look at it. ORION is the black one. This picture is stolen off the internet. The other crazy tri finished a few hours later. We didn’t stay up to watch, but we might as well have, because Bright Water was wallowing in the trough of the swell. Rolly rolly rolly. Falling on the floor rolly. 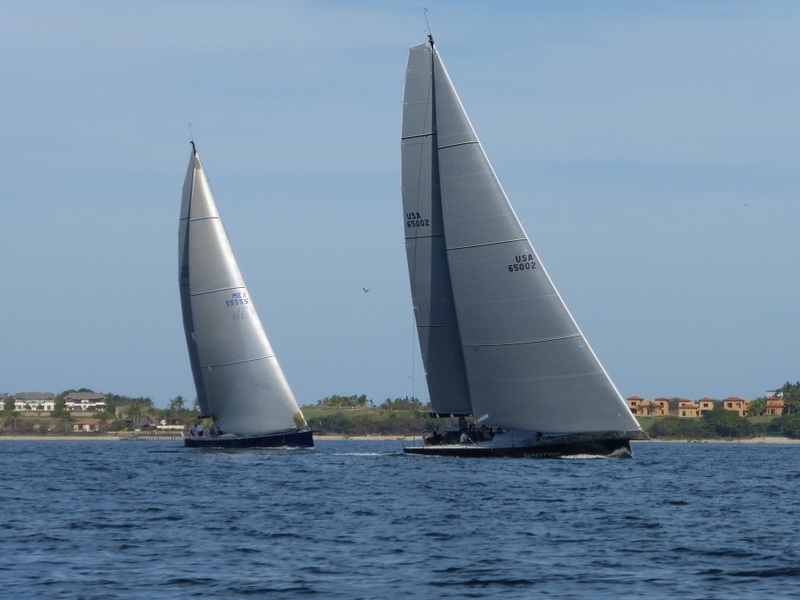 The rest of the race fleet, consisting of semi-normal looking full-on 60 and 70′ full-on race boats (including PYEWACKET), is facing light headwinds today and will begin to finish very early tomorrow morning. 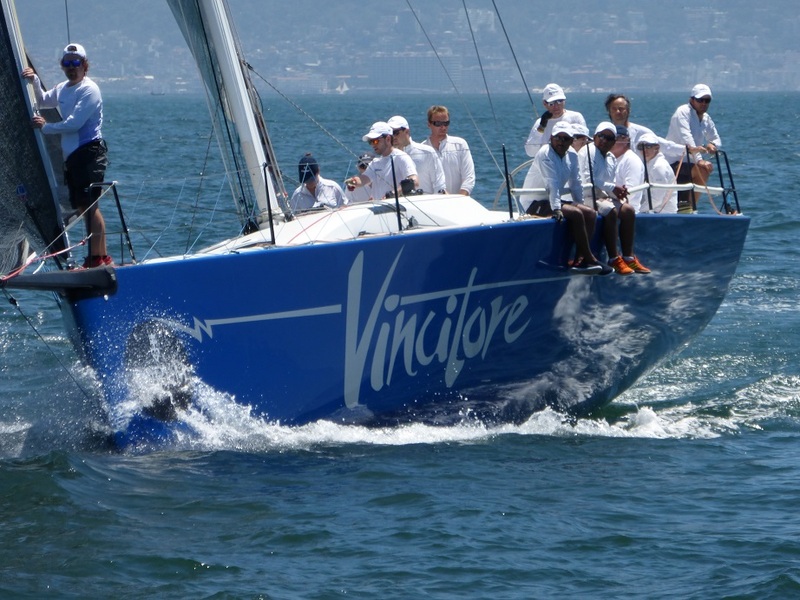 Hopefully the spectator fleet will return to the finish and pictures will be available. These are your race officials. Very nice people. There were no Blue Blazers.